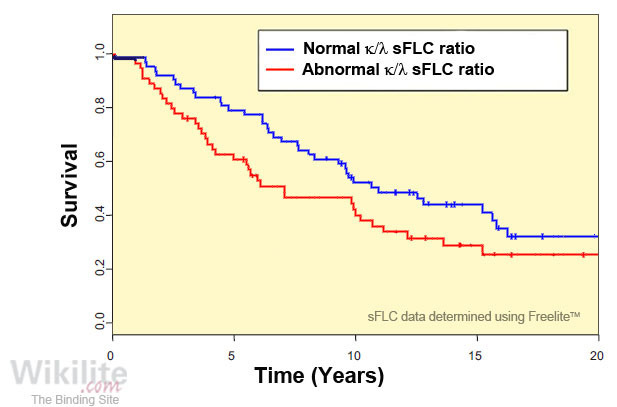 An abnormal κ/λ sFLC ratio at baseline is associated with increased risk of progression to multiple myeloma and reduced overall survival in patients with solitary plasmacytoma of bone. 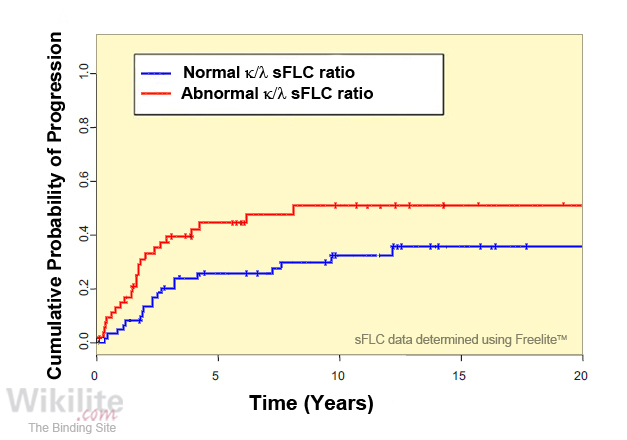 Risk stratification models incorporating sFLC analysis identify solitary plasmacytoma patients at greater risk of progression to multiple myeloma. Assessment of baseline sFLCs is recommended by IMWG guidelines  and a European expert panel  (Section 25.3.1) to assess risk of progression. National Comprehensive Cancer Network® (NCCN®) guidelines also recommend sFLC analysis alongside serum protein electrophoresis (SPE) and sIFE in a panel of tests for surveillance/follow-up of solitary plasmacytoma after primary treatment (Section 25.8) . Similar recommendations were recently reported by a European expert panel . They recommend that when measurable concentrations of a monoclonal protein or sFLCs are present, the IMWG uniform response criteria  be used for response assessment (Section 25.3.5). 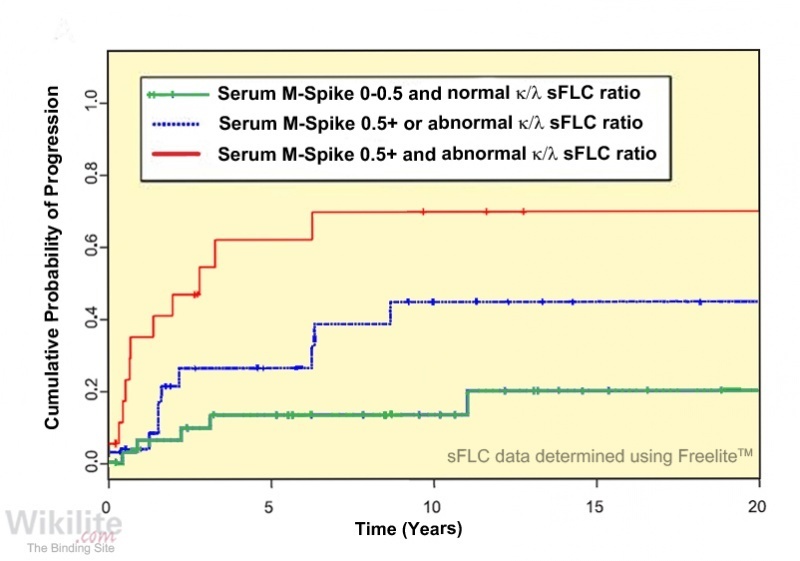 What is the reported 5-year risk of progression to MM in SPB patients with an abnormal κ/λ sFLC ratio? Based on the risk stratification model reported by Dingli et al. , which two factors can effectively discriminate SPB patients at low, medium and high risk of progression to MM? Which two risk factors were defined by Fouquet et al. 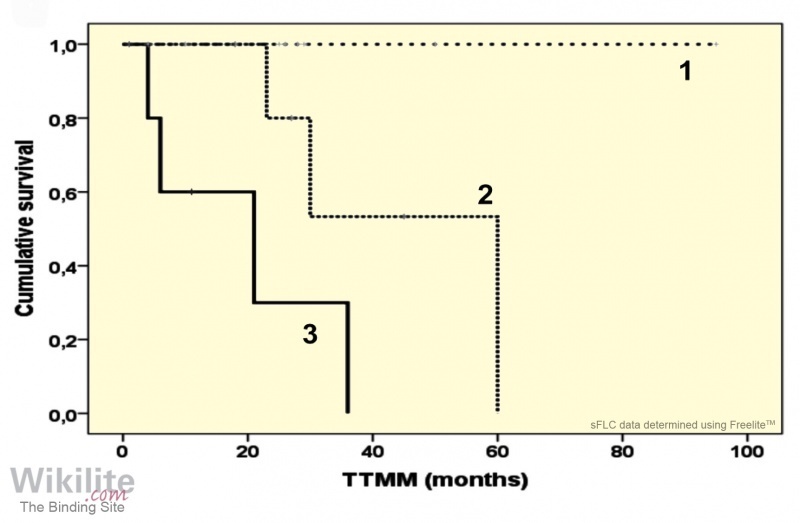 to identify solitary plasmacytoma patients at risk of progression to MM? 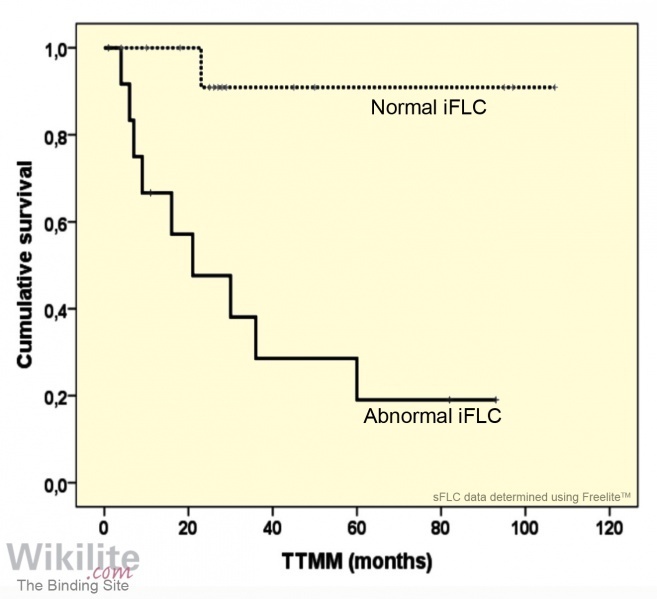 The κ/λ sFLC ratio at baseline and the persistence of a monoclonal immunoglobulin after 1 - 2 years (Section 21.3). An abnormal iFLC concentration and the presence of ≥2 hypermetabolic lesions by PET CT at baseline (Section 21.3).